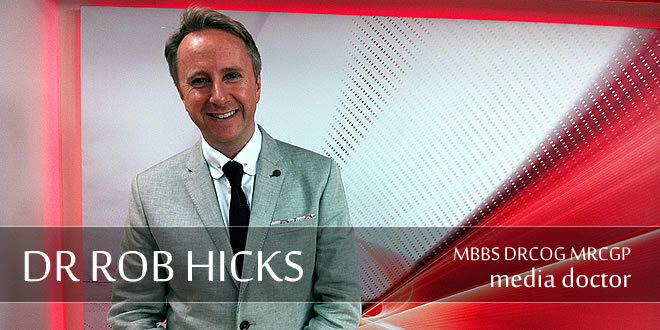 Dr Rob is one of the UK’s most popular and well-known media-doctors. A experienced doctor and health communicator Rob is a GP and has most recently worked in a hospital sexual health clinic. Rob’s special interests encompass all aspects of family health, lifestyle management, and complementary therapy. He lives in Greater London with his family. Rob is the resident doctor and a presenter on Sky TV’s ChrissyB Show. As an in-demand ‘go to’ media-medic he’s a sought after medical commentator and contributor. He has appeared as a medical expert on many national TV programmes including ITV’s This Morning and Good Morning Britain, Sky News, Channel 5 News, Channel 4 News, ITV News and BBC News, and on national and regional radio programmes including BBC Radio 5 Live, TalkSport, Classic FM and LBC. A prolific health writer and medical journalist he has contributed to numerous publications including the Express, People, and Daily Mail newspapers, and the Mail on Sunday’s ‘You’ magazine. A highly respected author Rob has written three books – ‘Control your blood pressure’, ‘Beat your allergies’, and ‘Old-Fashioned Remedies – From Arsenic to Gin’. He is a highly skilled medical editor and contributes to numerous websites including NHS Choices and BootsWebMD. He is a medical script adviser to the award-winning BBC1 television drama series “Doctors”, and was also the medical consultant for the BBC2 series ‘Grow your own drugs’ and for Sky TV’s ‘Bigger than ….”. To get the work-life balance right Rob enjoys being a singer/songwriter in a band, singing with the North Kingston Choir, cycling, and most importantly, being a dad!